Our new room remains dedicated to Ryan Bonaminio. The YMCA Bankruptcy in January 2013 was very difficult for our Youth Judo Club — but our new home at the police department is much better and a more fitting place for our continued dedication to Ryan. 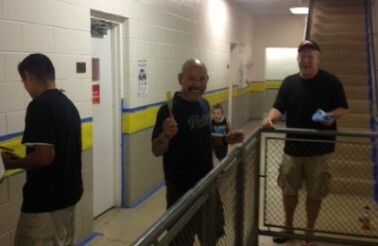 The Riverside Police Department, Riverside YMCA, and Riverside Judo Instructors collaborated on dedicating the Riverside Youth Judo Club Mat Room in a respectful and meaningful way. The goal was to create an environment where education, physical fitness, respect, humility, integrity, and service would be taught as a foundation. We all agreed that Riverside Police Officer Ryan Bonaminio exemplified each of these characteristics. Ryan was born in Riverside on November 25th, 1982. He attended Ramona High School where he excelled in his studies and the ROTC program. In 2000, he enlisted in the United States Army where he served two combat tours in Iraq. He joined the Riverside Police Department and graduated the Police Academy in 2006. 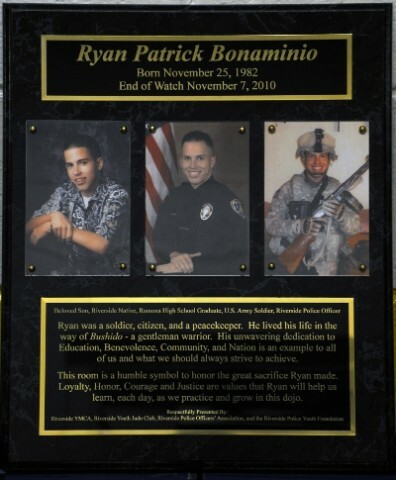 Ryan was a few weeks short of his 28th birthday when he lost his life in the line of duty on November 7th, 2010. Ryan cherished his service to others throughout his life. A most important goal of Judo is to become a better member of society. Ryan demonstrated this belief each day of his life. 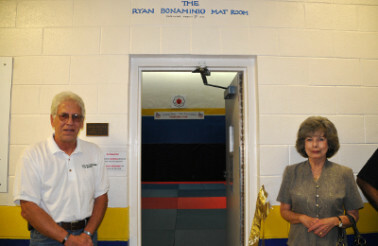 The Ryan Bonaminio Mat Room was created to help teach these valuable characteristics to our City’s youth — Ryan’s example will help us reach that goal. 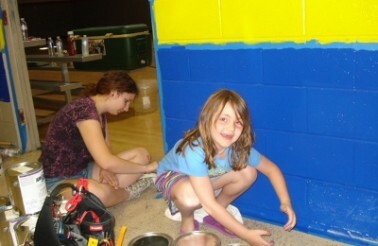 The Ryan Bonaminio Mat Room was a community effort. 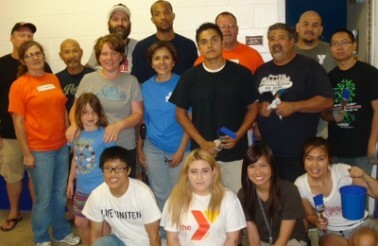 The YMCA director and staff helped along with numerous volunteers from the Riverside Judo Dojo (and their families) , Home Depot, and Circle K. The mat room came together beautifully with gracious donations and some physical labor. 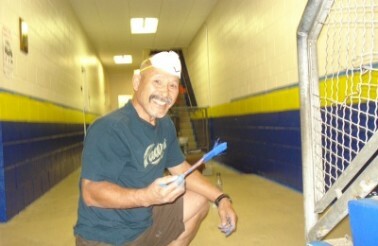 The following photos show the mat room conversion from a simple racquetball court, to a very nice Judo Dojo.